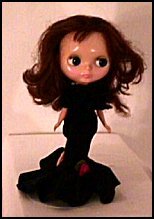 Kenner gave us Blythe in 1972. What's so special about this 11 inch, wide-eyed beauty? (Supposedly, the eyes were influenced by Walter Keene's big-eyed paintings from the late sixties and early seventies.) What sets her apart from all of the other great dolls released in 1972? Her twist and turn waist? Nope. Her 12 different mod clothing sets? Huh-uh. It's her eyes that make her special. Blythe can change her eye color like other dolls change shoes. Just pull the string in the back of her head and you can pick from beautiful-blue, bouncy-brown, groovy-green and pretty-purple. There is a fifth variation that has pink eyes. Blythe is easy to find today and almost always in working condition. The problem is that she is always missing her shoes. Blythe shoes are gold! It is also common for there to be some body or hair damage, perhaps caused by grasping the doll by the head to pull the string. Patience should still yield a nice doll for your collection.